Using Dawn dish soap to rid your pet of fleas is a surprisingly effective home remedy. The oils in Dawn prevent the eggs from sticking to your pet's coat while at the same time smothering the fleas. Be sure to use Dawn dish soap. According to many groomers other brands are not as effective. The Dawn flea bath is a cheap and safe alternative to harsher washes on the market. Fill up a bath tub or appropriate sized container with warm water and enough Dawn to create bubbles. 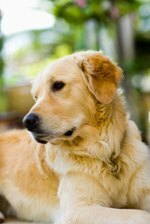 Take a capful of Dawn and a small amount of water and lather around the dog's neck before placing your dog in the bath. This must be done very quickly or the fleas will crawl into your dog's nose and ears in an attempt to escape. Place your dog into the water and quickly lather his entire coat. Make sure he is saturated and do not rinse. Take care when lathering around his face avoiding his eyes. Lather the entire underside of your dog. Do your best to fully lather the entire area. Again, do not rinse. Leave the lather on the dog for at least five minutes. This is necessary to ensure the fleas are killed. Rinse the dog. Be sure to rinse off all of the soap to avoid over drying your dog's coat. Comb your dog's entire coat with a flea comb to ensure there are no fleas left on his body. If you do find any remaining fleas drop the flea in a concentrated cup of Dawn and water to kill them.